The setting and atmosphere are thickly textured – tamarind trees surround the house, “creating a tantalising illusion of shade, in this burning climate.” In their branches lives a gigantic snake, while at every day-lit hour, the aptly named brain fever birds can take up their repetitive refrain of ‘Who are you? Who are you?’ It’s a breathless read with little to assuage the suffocation of the girl’s existence, especially as she herself begins to doubt her own substantiality. Kavan captures her feelings of helplessness as vividly as she paints her husband’s growing irritation. As clouds gather, laden with the long-promised rain of the monsoon season, the tension builds, until it is clear only something drastically calamitous can change the hell they’ve trapped themselves within. And, curiously, it’s at this point that Kavan sweeps us back to a mid-point in the tale, relaying the same events with the same rhythm but with subtly different phrasing and observations. The swirling sense of heat, dread and escalating claustrophobia intensifies until it seems the ground must crack right open and swallow our characters open. Kavan’s writing manages to be both restrained and descriptive, conjuring a three-dimensional world crammed with seething, unconcerned life. As you read you’ll find yourself breathing humidly pungent air and hearing the whisper of myriad insects. Worst of all, you’ll listen out for the creak of Mr Dog Head’s tread on the stair, and will yearn with ever fibre for his young wife to make her desperate escape. 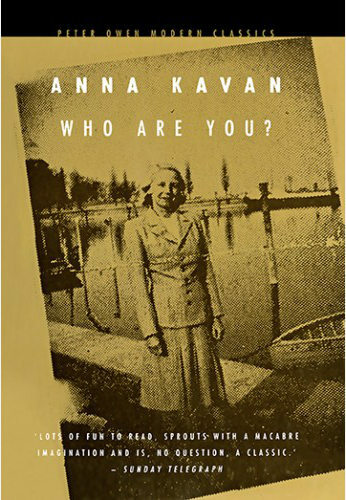 Who Are You by Anna Kavan is a Peter Owen Modern Classic. It’s available to buy from Amazon. This entry was posted in Reviews and tagged Anna Kavan, Book reviews, Peter Owen Publishers, Who Are You? by Judy. Bookmark the permalink.